Ingredients have a way of becoming trendy. Pomegranate molasses was certainly one of them. To be honest though, I'm years behind following anything remotely trendy. So as I write this post, I'm a little sheepish how all the praises have been sung long ago in the blogosphere. However, it certainly didn't diminish my enthusiasm for muhammara, a sweet tart spicy spread with Middle Eastern origins. Pomegranate molasses is a key ingredient for this addictive spread. 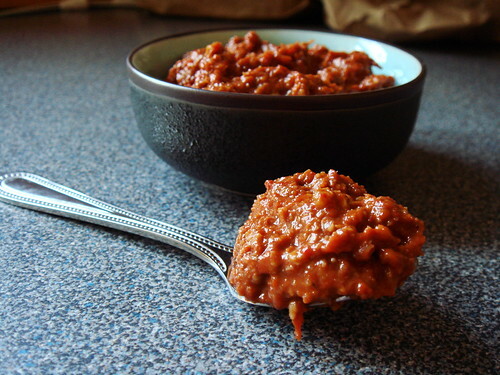 I first came across muhammara from a local newspaper article. I was immediately intrigued by the spicy version muhammara halabia and visited the deli the very next day to get my own. Oh my, I couldn't get enough! I ate it on pliable pita, crispy lavash, even directly from a spoon. I'm sure it would also be great on grilled meat but I never have a chance to find out. Lucky for me, the deli is far from my house and the dip is a little on the pricy side. Otherwise I would probably stuff myself silly with it everyday. During one of my muhammara shopping trips, I also bought a bottle of pomegranate molasses. At the time, I wasn't entirely sure what to do with it except knowing that it would come in handy should I attempt to make muhammara on my own. The opportunity finally arrived this weekend. Summer harvest is in full swing and gorgeous sweet red peppers abound at the market for a song. The rest of the ingredients are all pantry staples. I don't claim my muhammara to be authentic. However, it is a good approximation of what I get at the deli without using many exotic ingredients. I used smoked paprika and smoked salt (salish) because I love the extra layer of smokey flavour. I can't emphasize enough but you need the pomegranate molasses to provide that unmistakable sweet tart flavour. This recipe yields a lot of muhammara. Have a party and invite your friends to share! I think that's a fantastic way to get them hooked. Or, if you're like me, simply divide into small containers and stash away in the freezer. Blitz everything except for walnuts in a food processor until smooth. Add walnut and pulse until you have a thick paste. Thin with additional olive oil or liquid from the roasted red pepper to desire consistency. Personally I prefer a thicker spread for dipping. Adjust seasoning as necessary. This recipe yields a large batch. Divide between smaller containers and freeze what you don't immediately need. Otherwise, chill in refridgerator for at least 2 hours for the flavour to develop. Napa cabbage is great to have around the house. They stay fresh in the fridge for a long time and are good building blocks to many chinese dishes. I remember back in my days in university, it was the one vegetable that I always purchased, especially in winter when choices for fresh vegetable became scarce. It was a pleasant surprise to receive a huge head of napa cabbage from my CSA share recently. Asian produce was a bit unexpected. Not that I'm complaining! 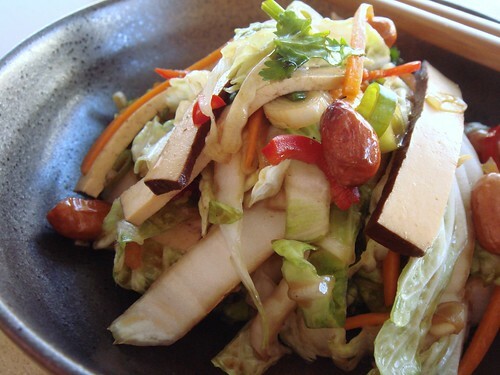 The following is a quick slaw with strong asian flavour. I love flavourful ingredients such as sesame oil, cilantro, and toasty oil-roasted peanuts (still in their skin). As for the red chili pepper, I'm a whimp when it comes to spicy food. You can certainly add more if you're into heat. Another option is to stir in a couple teaspoons of chili sauce into the dressing. To make dressing: in a small bowl, whisk together soy sauce, sesame oil, vinegar, salt, and sugar. Set aside. 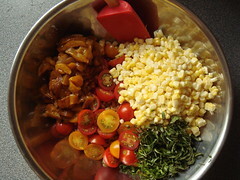 In a large mixing bowl, toss together all the rest of the ingredients along with the dressing until well-coated. Serve immediately for best result (so the vegetable stays crunchy and the peanuts don't soften) but I've been known to have a container of this in the fridge for quick dinner too. 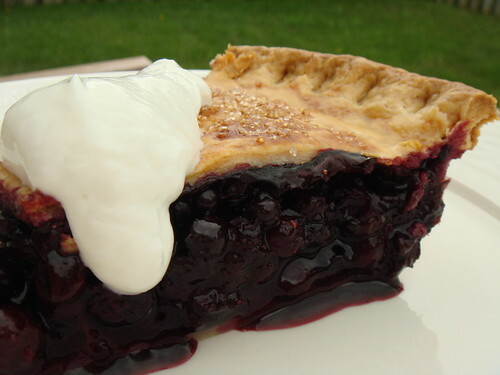 Wild blueberry pie is my absolute favourite pie, hands down. It is the one pie that I rarely make because wild blueberries is just so expensive. I don't go around foraging for wild blueberries so the only way that I get these intensely-flavoured berries is at the farmers' market. To fill a regular size pie, I need to purchase about $20 worth of fruit! If I am to buy my berries from grocers, I'll likely need to pay twice as much, oh my. I only bake wild blueberry pie for people I'm really really fond of. Hey, does it mean I'm quantifying my love with money? About three years ago, I semi-gave up on making pies. I could make a decent pie but to be considered truly excellent, I want my pies to have flakey buttery tender crust, no spillage, no soggy bottom, and fruit filling that miraculously suspend in barely set juices when you cut the pie into neat slices. After numerous attempts coming up short of perfect, I moved on to other baking projects. When I first met B, we often chatted about differences between Canada and the US. Thanksgiving holds much bigger significance south of the border. Until recently, B didn't have a chance to spend Thanksgiving with his family for years and he reminisced his family tradition of one pie for every family member. His pie of choice is chocolate cream pie. Chocolate cream pie is easy enough to make. I don't see it as "real" pie baking because it is cookie crumb crust filled with chocolate custard and whipped cream. When B visited me last year during American Thanksgiving weekend, I made him a show stopping chocolate cream pie for that sentimental reason. The combination of Rose Levy Beranbaum's deluxe chocolate crumb crust (held together with melted bittersweet chocolate) and Pierre Herme's chocolate pastry cream and billowy whipped cream was hard to beat. It was such a pleasure to watch him savour every bite that I was persuaded to return to pie baking. A few months ago I purchased Lucinda Scala Quinn's cookbook, Mad Hungry Cooking For Men & Boys. The title was interesting enough but that was not my reason for the purchase. I have long been an admirer of her work at Martha Stewart Living so it was a no-brainer for me to order her latest cookbook. Despite the gimmicky title, I enjoy immensely reading her anecdotes of what men and boys like to eat and learned a few things for sure. Specifically, under the dessert chapter in large fonts was the declaration Men Love Pie. Well, I certainly didn't know that before! I had to test her theory. This year, I'm more drawn to the eat local lifestyle than ever before. I frequent farmers' markets, pick-your-own farms, road-side vegetable stands, and of course my weekly CSA share. My love for locally grown fruit and vegetable doesn't stop even when I travel. Sweet corn in Illinois, strawberries in Florida, okras in Texas have all made their way into my market tote this summer when I traveled. And of course sour cherries. I buy them whenever I see them at markets. 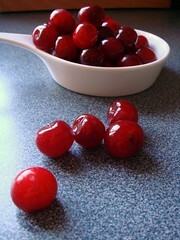 During the brief sour cherry season, I squirreled away bags of carefully washed and pitted cherries into my freezer. I didn't even know what I wanted to do with them until I realized if I want to come out of my pie baking retirement, they would be my perfect comeback partner. B swoons at all things cherries. I figure even if my comeback cherry pie falls short of being fabulous, he would still love it because of all the cherries. And that I bake him a pie from scratch. Fortunately, I did not need to find out. 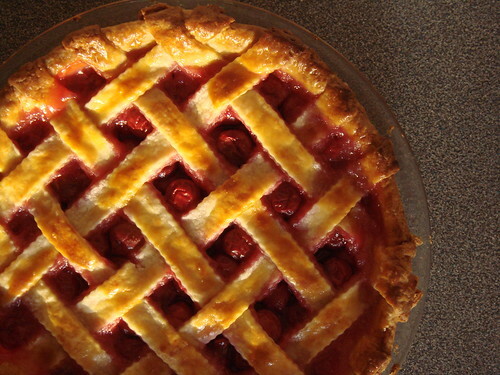 The cherry lattice pie with flakey cream cheese crust (recipe from Rose Levy Beranbaum's The Pie & Pastry Bible) came out textbook perfect. That weekend, things got a little tense at my house as B and my little brother T both vied for "just another slice of pie". They tied with half a pie each and I managed to steal two bites from B's plate. Lucinda is right about men and their love of pie. After the success of cherry lattice pie, I mentioned to B about the superiority of wild blueberry pie and the special place it has in my heart and my kitchen. Of course it would be mean to bait a boyfriend with only talks of such tales. With our first anniversary coming up, it would be as good an occasion as any to bake him a wild blueberry pie. After all, it is wild blueberry season in Ontario. I put a lot of thought into making this pie every step of the way. The cream cheese and butter were cut into the flour until pea-size pieces. I worked the dough gently but with confidence to a gorgeous marbling of fat. I did not lose patience and allowed the dough to rest in the fridge. I carefully picked through all 6 cups of tiny berries to remove all leaves and stems. I rolled out the dough and sealed the pie so precisely to avoid any chance of spillage during baking. Once the pie was assembled, I stored it in the freezer to avoid too much maceration and let the dough relax some more. Then B and I went out for dinner to celebrate our anniversary. By the time we returned home, it was too late to bake the pie even for late night dessert. You see, pies are not spontaneous. It needs to spend a long time in the oven and even a longer time out of the oven. My thickener of choice is cornstarch. A pie is done baking when the juice bubbles but for the juice to jell and suspend all the fruit filling, the pie almost need to cool down to room temperature. After some careful consideration, I turned on the oven and baked it anyway. The timing would work out perfectly for an extra decadent breakfast the next day. For the next couple of hours, my house smelled absolutely divine. B and I hovered over the pie in anticipation but knew better than to give in to temptation. As we were about to call it a night, little brother T was ready to head back to his apartment. Of course the wild blueberry pie didn't go unnoticed. After all, I did tell him that I would make it that weekend. When he looked at me expectantly with a plastic lunchbox in his hand and asked "is it ready yet? "...I simply couldn't disappoint him. You see this picture? That was the aftermath. As soon as I sunk the knife into the pie, I knew it. Way too early. 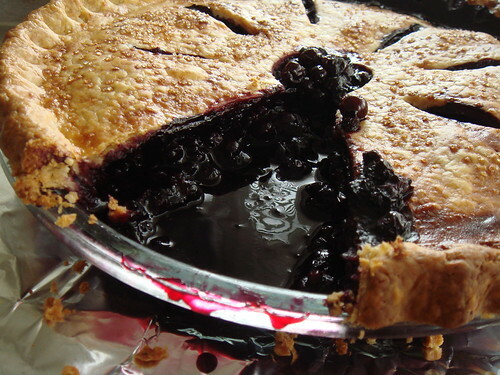 I did manage to remove a reasonably neat slice for T (after all, T is one of the few people I'm really really fond of so I can't possibly deny him of wild blueberry pie) but the sight of all that midnight dark juice gushing out from the pie into the empty cavity made me cry. And I cried a little inside every time I turned to look at the pie. Juice that was meant to thicken for maximum juiciness within each individual slice. After all that hard work....excuse me while I go cry some more. Perhaps I'm a little melodramatic. Here is another look at the pie all plated and pretty with a thick dollop of Greek yogurt. You can see that the fruit filling is a far cry from dry. Had I not shown you the disaster photo, you're probably none the wiser. B reassured me of the deliciousness of wild blueberry pie and that I was not exaggerating when I set him up with all that talk of berries and baking and money and love and yummy pie. Oh, and he now knows I like him enough to bake him a wild blueberry pie. 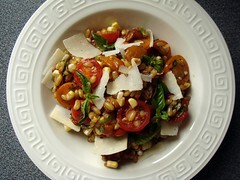 I love grain-based salads, especially on hot humid days of summer. 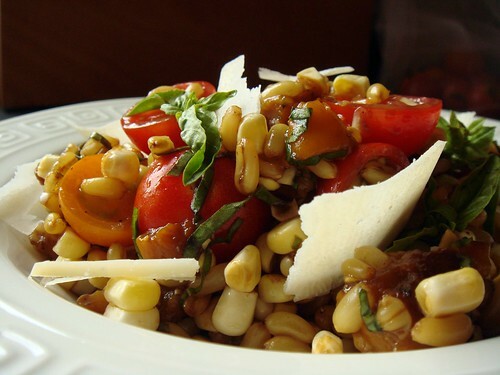 This hearty yet refreshing kamut salad bursts with summer ingredients including sweet corn, cherry tomatoes, roasted sweet peppers, and basil tossed in an olive oil balsamic vinaigrette. Quite simple really but when you have high quality ingredients that are in season, little needs to be done to make them delicious. The ingredients lean a bit on the sweet side so I like to balance it with savory shaved Parmigiano-Reggiano. If kamut is not your thing, feel free to replace it with farro, wheatberries, or even barley. Rinse the kamut. Fill a medium size pot with 3 cups of water, kamut, and a pinch of salt. Bring to boil and turn the heat down to a simmer. Cook for about 60 minutes until tender but still toothsome. Drain and set aside to cool. When the kamut is cooled to room temperature, place it in a large mixing bowl along with tomatoes, corn kernels, roasted peppers, and basil. In a small mixing bowl, whisk together olive oil, balsamic vinegar, and dijon mustard until it emulsifies. Toss vinaigrette with the rest of the salad. Season generously with salt and pepper. At this stage, you can store the salad in the fridge to let the flavour develop. To serve, garnish with tiny basil tips and shaved Parmigiano-Reggiano. Adjust seasoning as necessary.